The First International Legal Ethics Conference (ILEC 1), held at Exeter University in July 2004, took as its theme New Perspectives on Professionalism: Educating and Regulating Lawyers for the 21st Century. Professor Julian Webb and I, as Founding Editors of the international journal Legal Ethics, felt that more needed to be done in Europe to bring together a growing international community of legal scholars who were publishing, yet not physically discussing or sharing, critical and scholarly ideas for the development of legal ethics as an emergent sub-discipline. Despite the attraction of Professor Robert Gordon from Yale as our keynote speaker, only about 40 delegates attended, most coming from the Antipodes and North America, with a minority from the UK and Europe, which broadly reflected the provenance of material submitted to Legal Ethics. We saw ILEC 1 as another platform to supplement, and generate material for, Legal Ethics and as a means of bringing together legal ethicists and practitioners so that we could learn from each other about how best to promote ethical awareness within, but also beyond, the law curriculum. An Ethics Education Forum, established by the Law Society of England & Wales under my chairmanship to inform debates on the reform of ethical training, held one of its meetings at ILEC 1 and this helped build trust and a positive relationship with legal practitioners and expose the latter to international developments. The conference was considered a success and although numbers were modest the quality of the papers and discussion sufficiently high that it was decided to meet biennially and institute the ILEC series. Several ILEC 1 pioneers in fact met the following February in Christchurch, New Zealand at an international Legal Ethics Colloquium, organised by Professor Duncan Webb, but ILEC 2, with roughly double the numbers attending ILEC 1, was organised by Professor Tim Dare in Auckland in June 2006, taking as its theme Professional Ethics and Personal Integrity with Professor William Simon of Columbia as its keynote speaker. ILEC 3, co-hosted by law schools at Griffith University and the University of Queensland, met in July 2008 on the Australian Gold Coast, but this time numbers had more than quadrupled, with delegates coming from a much wider geographical base, though still underrepresented from Asian, African and Latin American countries. ILEC 3 chose as its theme Integrity in Legal Practice and actively incorporated into the program judges, legal practitioners, regulators and policymakers whilst bringing together eminent US and Australian keynote speakers. ILEC 3 was a hugely significant milestone that gave invaluable momentum and publicity to the ILEC series. Under the leadership of Professor Deborah Rhode and our Stanford hosts, ILEC 4 gave yet further impetus to this fledgling international movement by founding in July 2010 the International Association of Legal Ethics (IAOLE) and bringing together around 170 legal ethicists from around the globe. ILEC 5 met in Banff, Alberta, in July 2012, and was co-hosted by the University of Calgary and Dalhousie University. This meeting attracted over 200 participants from around 20 different countries and confirmed the study of legal ethics as a global movement now bringing together not only legal scholars but also judges, legal regulators and practitioners interested debating the following key themes: empirical approaches to legal ethics; culture, ethics and society; philosophy and legal ethics; regulation of the profession and ethics and education. In July 2014, exactly ten years after ILEC 1, ILEC 6 returned to the UK to meet at City University Law School, London. Numbers had grown considerably and this time there were well over 230 participants with 140 presentations covering new themes such as the impact of technology on ethical practice; law and religion and also judicial ethics. Perhaps most noticeable was the breakthrough to jurisdictions beyond the common-law world: this time delegates came from over 35 countries with significant representation from eastern Europe (Bosnia-Herzegovina, the Czech Republic, Croatia, Lithuania, Poland, Russia) and the Middle East (Iran, Israel, Kuwait, Oman, Turkey). Contrasting common law views of ethics were well-represented by personal and thought-provoking parables delivered by Lord Justice Laws, in his after dinner speech held in the Great Hall of the Inner Temple, and Professor Deborah Rhode’s ethical sermon delivered the following morning at the Temple Church. 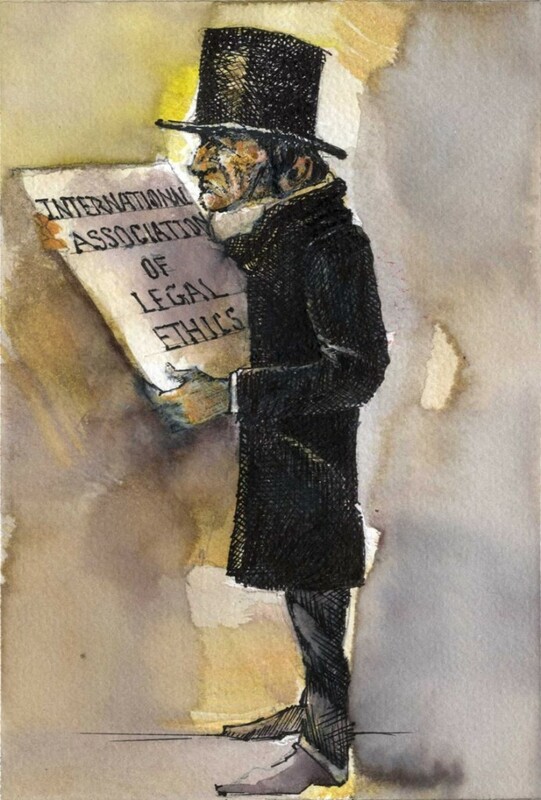 Over the past decade the ILEC series has established momentum and greater awareness of the ethical and moral foundations of modern lawyering, and throughout the world. While much work remains to be done in many jurisdictions to justify, and secure, the rightful place of legal ethics in the law curriculum of the future, and legal thought more generally, the ILEC series continues to inspire the next generation of law teachers to find new ways to communicate the excitement, commitment and skepticism that perhaps characterizes the scholarship and values of our emergent discipline. 1 R. Gordon, “Professionalisms old and new, good and bad” (2005) 8 Legal Ethics 23. 2 See report of ILEC 1 by S. Nelson, “Reflections from the International Conference on Legal Ethics from Exeter” (2004) 7 Legal Ethics 159. 3 Now established as the biennial Australia New Zealand Legal Ethics Colloquium (ANZLEC) series. 4 L. Haller, “Professional Ethics and Personal Integrity: Report from the International Conference on Legal Ethics, Auckland, New Zealand” (2006) 9 Legal Ethics 13. See also Professional Ethics and Personal Integrity, Edited by Tim Dare and W. Bradley Wendel, Cambridge Scholars Publishing, 2010. 5 See F. Bartlett and R. Mortensen, “ Integrity in Legal Practice: A Report from the Third International Legal Ethics Conference, Gold Coast, Australia” (2009) 12 Legal Ethics 100. See also conference report by L. Webley: http://www.ukcle.ac.uk/event/legal-ethics-2008 and edited collections based on conference papers: F Bartlett, R Mortensen and K Tranter (eds), Alternative Perspectives on Legal Ethics, Routledge (2010); K Tranter, F Bartlett, L Corbin, R Mortensen and M Robertson (eds), Reaffirming Legal Ethics, Routledge (2010). 6 See D. Rhode, “Invitation to Join the Newly Formed International Association of Legal Ethics” (2010) 13 Legal Ethics ix-x. See also conference report on ILEC 4 by V. Holmes and K. Hall, “The Legal Profession in Times of Turbulence” (2010) 13 Legal Ethics 209. 7 See A. Woolley and R. Devlin, “Merging Worlds, Emerging Discourses” (2012) 15 Legal Ethics 379. 8 See R. Mortensen, “Legal Ethics at a Time of Regulatory Change: The Sixth International Legal Ethics Conference, London” (2014) 17 Legal Ethics 425. Sir John Laws, “Sydney’s Sketches, Sydney’s Fingers—After Dinner at The Inner Temple” (2014) 17 Legal Ethics 427; D. Rhode, “Watching the Muffins—The Temple Church Sermon” (2014) 17 Legal Ethics 430.